We were delighted to welcome HRH The Duchess of Cornwall to Swindon on Thursday 24 January to celebrate the work being done by Swindon Stories. Her Royal Highness attended a book gifting event at North Swindon Library in the morning, then went to the Lyndhurst Centre, a centre for looked after children, in the afternoon to observe the brilliant work being done there. 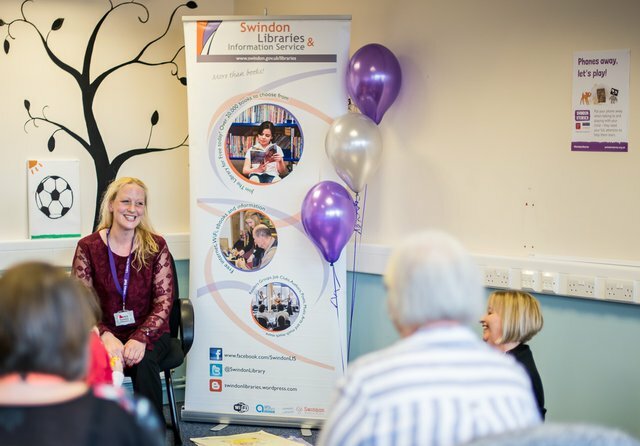 The visit marked the one year anniversary of Swindon Stories, the National Literacy Trust’s Hub in the town. Launched in February 2018, campaign highlights have included a Lost Words trail, promotional materials designed by Swindon-born author and illustrator Steve Antony, and the publication of Swindon’s 100 favourite children’s books. National Literacy Trust programmes promoting reading for pleasure, employability skills and early language use have been piloted in schools and colleges across the town. One of the Hub’s priorities is improving literacy outcomes for looked after children. Swindon has a much higher than average number of looked after children than the national average. Outcomes for these children are universally low: nationally only 6% of foster children go on to higher education, compared to 50% of young people from a more advantaged background. 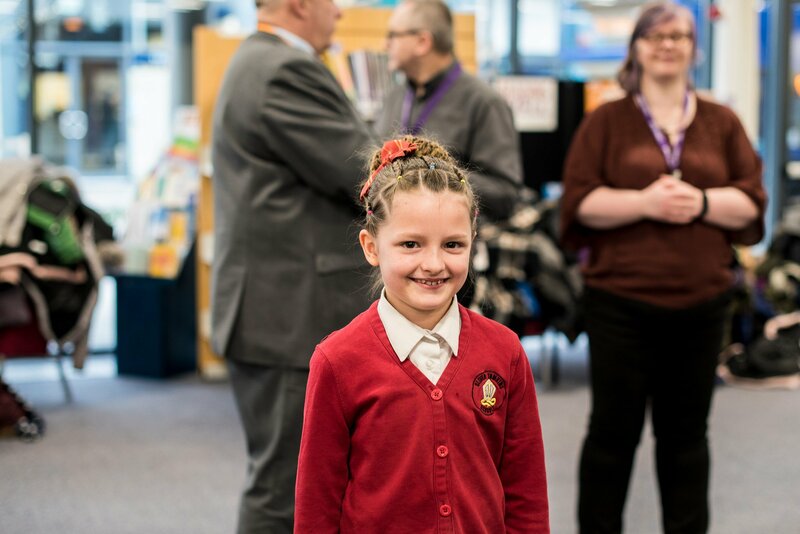 Through the National Literacy Trust’s partnership with WHSmith, every child taken into care in the town is given book tokens and a notebook. We ensure our programmes in early years settings and schools reach these children directly, and have begun supporting fosters carers with training to support improvements to the home learning environment, through shared reading to promote attachment. Her Royal Highness’ visit to the Lyndhurst Centre highlighted the important work being done there, and raised awareness of the literacy challenges faced by the children who visit the centre. 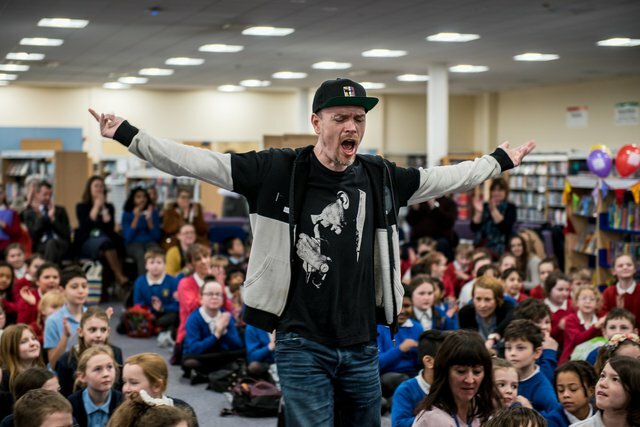 Every primary school in Swindon was invited to take part in a Lost Words poetry competition, inspired by The Lost Words by Jackie Morris and Robert Macfarlane, a book celebrating nature words that have left children’s common usage. Schools also hosted a National Literacy Trust assembly on Thursday morning celebrating these Lost Words. 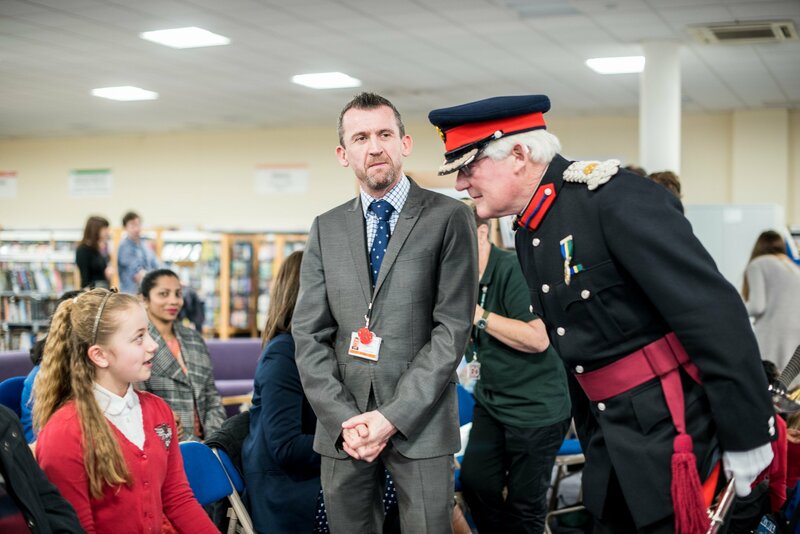 On arrival at Orbital Shopping Park (owned by British Land), where North Swindon Library is based, Her Royal Highness joined children from Sevenfields, King William CE and Oliver Tomkins Primary Schools in a Lost Words hunt. 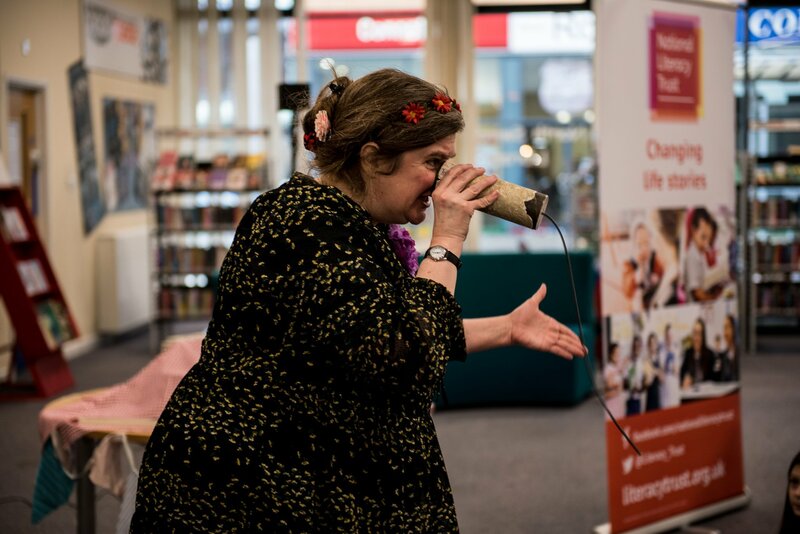 She then joined a ‘Booknic’ storytelling session for 200 local schoolchildren with storytellers Dom Berry and Olivia Armstrong. Thanks to the generous support of British Land, over 600 primary school pupils in Swindon have taken part in our Young Readers Programme over the past three years, each receiving three brand new books to keep and getting the opportunity to take part in exciting reading-themed events at Orbital Shopping Park. 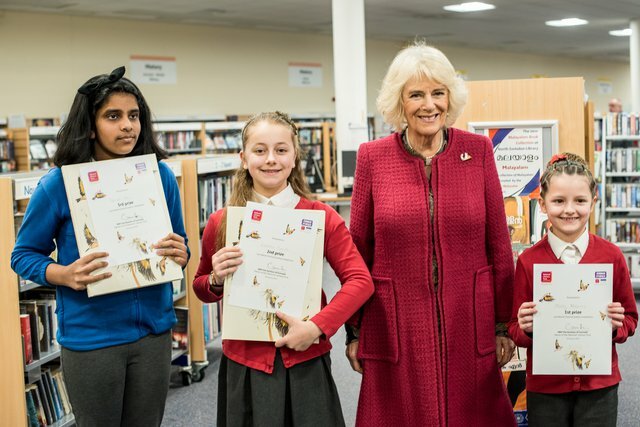 The winners of the Lost Words poetry competition were announced by Jonathan Douglas, Director of the National Literacy Trust, and were presented with certificates, and a copy of The Lost Words, by Her Royal Highness. Her Royal Highness also read a poem, celebrating old Wiltshire language. While the poems were read out, Steve Antony, Award-winning children’s author/illustrator and Patron of Swindon Children’s Reading Services, sketched images which were then presented to Her Royal Highness. Kind thanks go to Penguin Random House, Hachette Children’s Books and Steve Antony for their generous book donations for ‘Booknic’. Her Royal Highness then went to the Lyndhurst Centre to meet Swindon Council’s fostering team. She met foster carers and children, and joined in with some craft activities based on The Lost Words. The National Literacy Trust ensures that programmes in early years settings and school reach foster children directly, and have begun a programme of work recently to support foster carers in the home learning environment, a key organisational focus for the charity.